The city of Puerto Plata curves around the base of towering Mt. Isabel de Torres, whose pinnacle can be reached by an electrified sky lift system called the teleférico. A manicured botanical garden dominated by an illuminated statue of Christ - a scaled-down version of the one in Rio de Janeiro - crowns its summit. The charm of Puerto Plata, the largest city on the North Coast, is enhanced by the extent and variety of its Victorian architecture, unrivaled by any other Dominican city. Stylistically, the gingerbread motifs, wooden 'lace' filigree, and pastel colors of its houses and public buildings convey the romantic aura of an earlier time, but functionally they house a tourist-oriented city's businesses, offices, shops, bars, restaurants and clubs. History is also preserved here in the imposing San Felipe Fort, built by the Spaniards in the 16th century as protection against seaborne invaders. The fort, which was used as a prison until the 1960's, now houses a fine museum that documents its interesting history. Visitors strolling the city's picturesque streets will also want to take time to see Puerto Plata's extraordinary Amber Museum, the Brugal rum factory, and stroll the length of the Malecón, the lively seaside boulevard. Within the area of Puerto Plata, you can find upscale neighbourhoods such as Bayardo, Torre Altas and of course ocean front apartments along the recently renovated malecon. 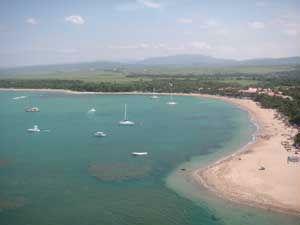 Moving west along the coast are the residential / vacation areas of Costambar and Cofresi, which offer value for money ocean front villas at prices seen in the Sosua / Cabarete area 4 years ago. While some feel comfortable in the ex-pat enclaves of Sosua / Cabarete, others who are looking to make the move long term, might find Puerto Plata or Costambar a more practical choice due to the proximity of schools, supermarkets and medical facilities.